Starting in Reading the route follows the navigable River Kennet to Newbury and then on to the attractive town of of Hungerford. Beyond Hungerford it passes through what remains of the Savernake Forest and passes through the 400m Bruce tunnel. The route then takes you across the remote Vale of Pewsey offering views of white horses cut into the chalk hills and taking you by the Lady's pool - an extra wide part of the canal made to look like a pool to please the landowners that the canal passed through. The canal passes through the fine market town of Devizes with before dropping down to the Wiltshire Plain. This is acheived by the Caen hill flight of locks which has 16 locks one after another within a total flight of 29 locks. A handy cafe at the top of the flight provides impressive views over the Wiltshire Plain. The route then crosses the Wiltshire plain before reaching the impressive riverside town of Bradford on Avon. After Bradford on Avon the route enters the steeply wooded Avon valley, crossing the river twice on impressive aqueducts before carrying you into the heart of the majestic city of Bath. The route is blessed with contrasting countryside from soft chalk hills to broad plains and wooded valleys. 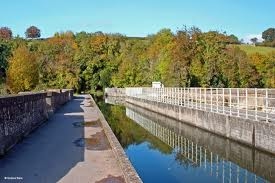 Along the way you'll encounter feats of canal engineering including the Dundas aqueduct, Caen lock flight and Lady's pool and Bruce Tunnel. The canal is a broad canal which links to the sea via the River Avon so you will see lots of weird and wonderful craft on your journey. 4 nights/3 days walking. Pewsey to Bath. Why not take a rest and exploration day in the elegant and beautiful city of Bath. The city is a UNESCO world heritage site full of historic buildings and great attractions including the Royal Crescent, Roman Baths, New Spa, Pulteney Bridge, Jane Austen centre and great shops.